Are you excited about e-commerce, but too busy to get into the details of setting it up? Interested in drop shipping, but having neither time nor skills to start it all from scratch? Does it mean you can’t launch a drop shipping store? Why limit yourself and forget about this business opportunity if you can delegate unfamiliar tasks to skilled experts? We have created a full-scale solution for those who can’t or don’t want to waste their time on creating a drop shipping store from scratch. In other words, you can easily start your drop shipping journey by ordering a ready-made custom store. Maybe you already have a website. Or maybe you have enough skills and knowledge to build your own store and can go without any professional help. We guess it’s the most important reason why thousands of people all over the globe buy ready-made stores from us. Basically, the thing you get in the outcome is the complete e-commerce solution. You get a fully functioning webstore with already imported products ready for sale, and a shopping cart that enables a seamless purchase procedure. Our websites also support the most popular payment gateways, so your store visitors will be able to use any of these convenient and secure payment methods. Finally, a range of marketing tools is also integrated into the webstore. Therefore, you get an access to various promotional options such as discount coupons, product reviews, emails for abandoned carts recovery, subscribers lists, etc. As soon as we confirm the development process is over, you can start making money right away! Speaking of money, it’s important to mention that only a one-time payment is needed. – fees for processing your payments through a specialized service. The only type of inevitable additional cost is payment for hosting – it means that you will need to pay some hosting provider to keep your website connected to the internet. Ordering a custom store from our team, you get 100% ownership of the website. You probably think it’s ridiculous to mention this (hey, I paid for this store, of course, it’s mine!) Still, you’d be surprised to learn that it’s common for some platforms to keep control over stores that they have created for their customers. You can find stories like this written by frustrated dropshippers whose stores were even closed in all of a sudden. Here, it is not the case at all. The store fully belongs to you, and you are not limited in the choice of products, number of orders, volume of sales, store design, content, etc. It’s up to you to customize your store, add or remove pages, edit text and graphics content, and do anything you wish. You can even sell your store for a nice profit! The store will be created with your specific requirements in mind. The customization process starts from the moment we help you choose a drop shipping niche, and continues when we create several various design elements for you. Remember that your store will be built upon one of the themes we’ve carefully developed – these professionally designed themes are an exclusive product of our skilled specialists. These themes are elaborately tested for their ability to generate more sales and bring you higher profits. We are constantly updating our solutions to make sure they meet the highest industry standards. Automated drop shipping solutions are your key to a profitable and easy-to-run business. When we provide you with an access to your webstore, you can view all-in-one dashboard to monitor all your sales, orders, stats and activities. It means that you always stay informed about your store performance, therefore you can manage your business effortlessly and effectively. To make this task even easier for you, we automated the most challenging parts of drop shipping business: orders fulfilment and store promotion. Thus, the auto-filling feature lets you place orders on AliExpress automatically, and the special Social Rabbit plugin lets you run and manage 4 different social networks at once like an experienced SMM specialist. What exactly happens when you place an order for your custom store? Well, if you want to know more about the procedure, here it is! You are contacted by a personal project manager who will guide you throughout all the processes. You will be added to the relevant project on Basecamp, a special platform where you can easily monitor all the activity around your store creation. It gives you control over the working process – you are free to leave your comments, ask questions, and write your thoughts and opinions about all the things. Remember that we value your feedback a lot! Well, most likely you don’t even want to know anything about this 🙂 And it’s completely fine: our designated specialists do the technical part so you have nothing to worry about. To put it shortly, the things that happen at this stage are domain purchase, setting up hosting, installing WordPress and the plugin, setting up payment gateways, integrating Google Analytics, and also adding contact info at your site. Even if you didn’t understand a single word out of this list, no problems! You don’t have to be an expert, and why would you even need to go deeper into details if all of these are our team’s concerns? Oooh, that’s one of the trickiest parts, as you know. In drop shipping business, it is really important to choose a niche that is competitive, marketing-friendly, and interesting to you personally. It’s cool if you already know what you want to sell – experienced store owners say it is a great idea to work with a niche you’re passionate about. Still, even if you can’t make up your mind on a specific niche, it is fine. Our analysts will help you choose a niche, and they will take into account numerous factors: current trends, niche’s potential for SEO, and a range of general parameters. All in all, we will do our best to offer you a demanded and profitable niche that will help you succeed! Selection of product categories is a really important stage of a drop shipping store development because it defines the logical structure of your website. The easier it is for customers to navigate your store, the better is their opinion about it – and the higher are conversions! Surely enough, the right products selection means the world for your drop shipping business, and we treat this task with due attention. We research the product offer on AliExpress and do our best to only add the most popular and highly demanded items to your store. We base our choice on a number of criteria to make sure the offers will be appealing to your customers. When your store is ready, you can easily add more products yourself – thanks to the plugin, this procedure won’t take much time. Another meaningful part of this process is setting up the right currency and markup formula. The profit you get from drop shipping business is the difference between the price you set on your items and the original price of the same products that were initially set by AliExpress seller. It means that you need to treat your final prices really carefully! Our markup formula will help you out. It automatically changes the prices of the imported goods and follows the pattern you’ve set. In other words, you can either apply the same price settings to all the items or choose different settings for various product categories. To start with, the plugin comes with 3 different professional themes integrated. As we already mentioned, all of them are optimized in a way that ensures the highest conversion rate possible, and all of them were developed with various types of devices in mind. You are free to choose any of the themes to make your webstore look nice and memorable. Also, we will provide you with custom design elements, such as logo, header images, and favicon. All of them are essential to create a sense of uniqueness around your store. This is why we never use the same design elements: we create new ones every time relying on your personal preferences. This is a huge part of your store success, which is why we treat this task with great care. We start with single product pages. We’ve already discussed how your product page can be edited in a way that makes customers more interested in placing an order and, therefore, increases conversion rate. We carefully edit pages of every product we’ve added to your store. If you want to add new items, just follow our example – or edit everything the way you like! Also, we work a lot with SEO. Thoughtful search engine optimization is the key to driving more organic traffic to your dropshipping store. Finally, we prepare your store for promotion in social media. Social media is a great source of traffic, so you can use it to generate more sales and get outstanding income in no time at all. This is why our team will create good-looking and engaging accounts on the most popular social media networks to promote your store, raise awareness about it, and interact with potential customers. We have wonderful and charming project managers have a deep understanding of the tiniest details of a drop shipping store creation. Patient and emphatic, our team members are ready to help you out with any project-related issue. This person will coordinate the work of every member of our design and development team so that you can get your store in due time and in due condition. This is the person that will be there for you all the time – you will be able to easily contact them to learn the news, ask your questions, or leave your comments about the working process and its results. Your interests and preferences are crucial. Every webstore has its individual features, which is why we need to know exactly what you want to see in your future drop shipping store. The more details you provide, the more customized your site will be! We understand how important it is for you to keep an eye on the working process. You will be able to leave your feedback on every stage of our work, so that both you and our team are happy with the overall result. Your personal project manager will provide you with the access details as soon as the store is ready. Now it’s yours, so you can freely run and amend it the way you want! To make this part even easier for you, your manager will provide you with guides and instructions on the store management and promotion. We are always happy to help you with your store, no matter how long ago you’ve ordered it from us. This is why you can get in touch with us at any given time. As soon as we let you know that your store is ready, you can start making profit. 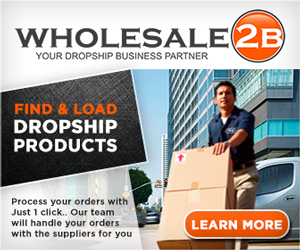 Get your very own drop shipping store and start making money right away! Don’t forget to use your coupon code CUSTOM10 and get a 10% discount!